The biggest natural port of the island of Ibiza, Bahia de Sant Antoni (Sant Antoni Bay), is one of most beautiful spots in the Mediterranean Sea. All the Sant Antoni zone is famous to be an excellent place to watch the sun setting. Although located in the same area, Sant Antoni de Portmany and Sant Antoni Bay are very different places in terms of the kind of visitors they receive. Sant Antoni Bay offers the perfect atmosphere to have a pleasant walk. It has a relaxed ambiance especially during the low season, when you will find it amazing to look at the calm sea. A beautiful promenade is the one through the Paseo Marítimo ('Maritime Walk' in English), that goes from the old city center of Sant Antoni, passes through s'Arenal Beach and reaches the cultural center Sa Punta des Molí. The Paseo Maritimo is plenty of summer terraces where you will enjoy a nice ambiance while drinking a cocktail with friends or nice local people. These terraces are usually open until midnight, when the party starts on the inside of the pubs and on the big discos of the island. 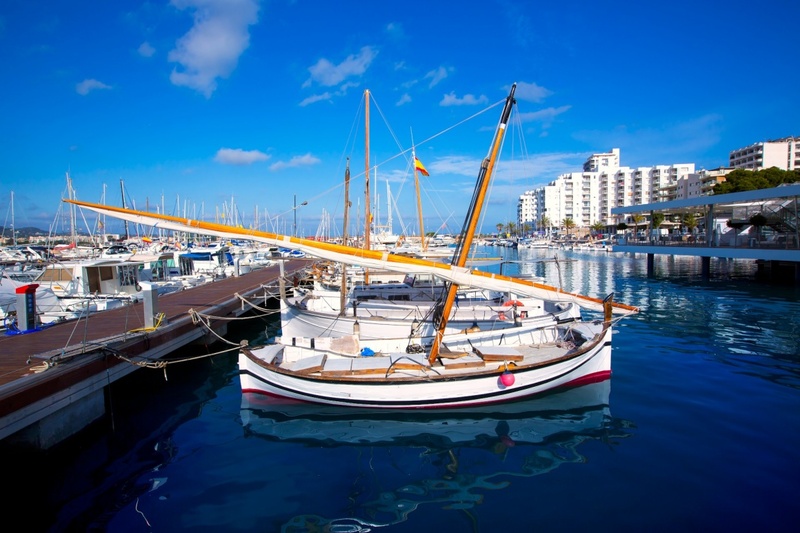 From the Paseo Maritimo you can also take a boat to several beaches of Ibiza, such as Port des Torrent, Platges de Comte or Portinatx. Another nice place in Sant Antoni Bay is the Passeig de ses Fonts which in English stands for the 'Fountain Walk'. Through this street you will find a lot of restaurants, bars and shops surrounding the main fountain where sound and light shows are sometimes performed during the summer months. In Sant Antoni Bay there is also a nice flea market of hand crafts where you can also take a nice portrait or caricature made by one of the painters who offer their services for reasonable prices. The patron Saint celebrations to honour Sant Bartomeu (Saint Bartholomew) are held on August 24th on San Antoni Bay, day that both tourists and locals enjoy the incredible fireworks next to the sea. Moreover, all through the year there are plenty of parties and activities for all ages held in this incredible town. It is definitely a good place to spend your holidays. Find information about selected Hotels, apartments and rooms in Bahia de Sant Antoni to choose the perfect place for your accommodation. ©2019 - ibizaisland.info All Rights Reserved.